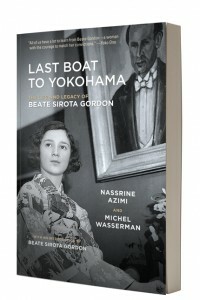 LAST BOAT TO YOKOHAMA: The Life and Legacy of Beate Sirota Gordon, by Nassrine Azimi and Michel Wasserman, continues to generate international interest and praise, as seen in a recent feature article about the woman and the book in The Japan Times, Japan’s largest English-language newspaper. Written by the respected author and translator Roger Pulvers, the article details Beate’s journey from birth to her Jewish family in Vienna, a move at age 6 to Tokyo, and prominence after World War II as “the only woman in the room,” her way of describing her part in the secret committee that gathered to write Japan’s new constitution, which included an article written by Beate ensuring women’s equality. Mr. Pulvers is full of enthusiasm for LAST BOAT, and particularly notes its effect of bringing notice to issues happening in Japan today. For information on purchasing this book, check out the summary page of LAST BOAT TO YOKOHAMA.